About a quarter of all Korean teenagers eat convenience store meals at least three times a week, a survey showed. The Korea Centers for Disease Control and Prevention conducted a survey and found that 39.3 percent of Korean teenagers obtained their meals at convenience stores once or twice a week, and 26 percent did so at least three times a week. When asked to explain their choices, 25.6 percent of respondents answered that they grabbed instant food simply because it was convenient. And 20.1 percent said they opted for convenience store food because they had no time. 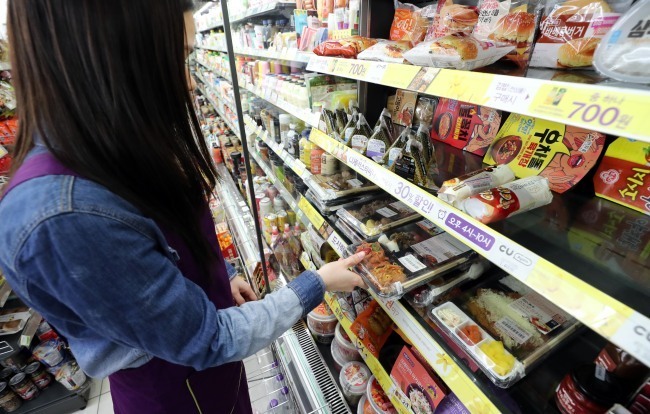 When asked what they had eaten at convenience stores over the past week, 64.5 percent answered instant noodles, including ramen, and 58 percent said prepackaged foods, including gimbap. These answers were followed by beverages (42.2 percent), sandwiches (25.3 percent) and crackers or biscuits (24.1 percent). The organization warned that teenagers who frequently ate meals from convenience stores were at risk of nutritional imbalances.